Before I start this review, I'd like to thank Thermaltake for making this review possible. I encourage all readers to check out Tt's site and products. 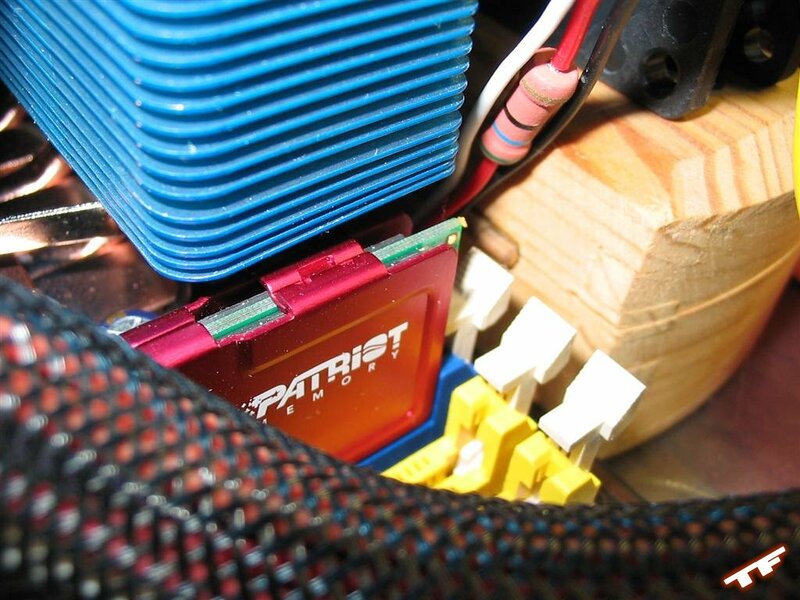 Thermaltake is a brand everyone should be familiar with whether it is their acclaimed Volcano line of heat-sinks, their Xaser line of cases or most recently their PurePower line of power-supplies. Despite a mediocre showing for the K7 line of processors (as shown in our review of the Volcano 11+), Thermaltake is back in full force with their K8 Venus coolers. 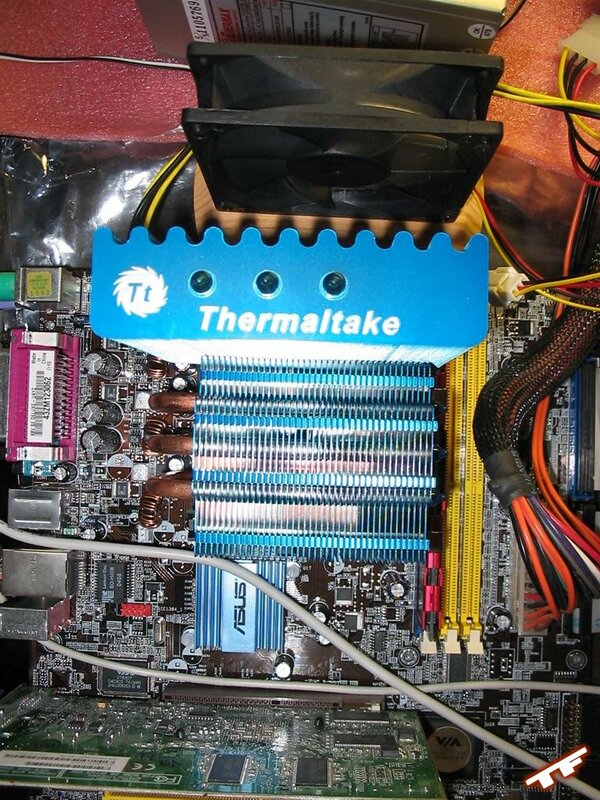 Most of the AMD64 Proc/Mobo combos are coming equipped with the Thermaltake Venus 7+ as the stock cooler and after a trip to Fry's Electronics, the 7+ is the recommended HSF for people buying AMD Athlon64 processors. The recent rage among computer enthusiasts is eliminating unnecessary case/system noise. 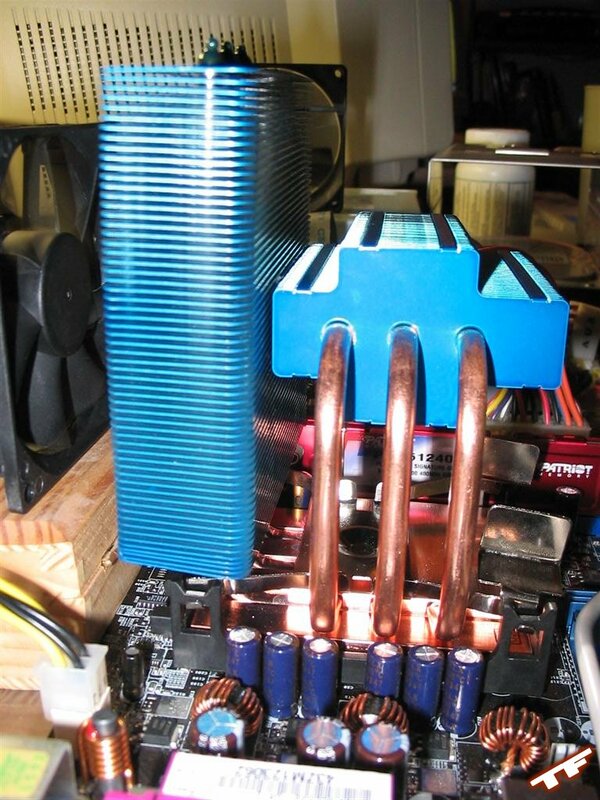 Previously, cool processor temperatures came at the expense of high-priced heat-sinks equipped with high CFM, 60+ dBA fans or a high-priced water-cooling kit. 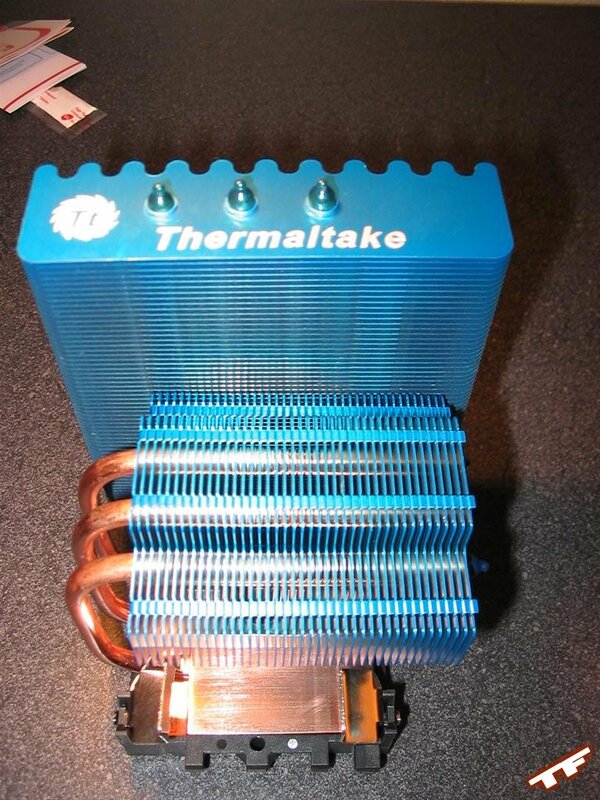 Today, I review the Thermaltake Fanless 103 P4/K8 Heat-Sink. 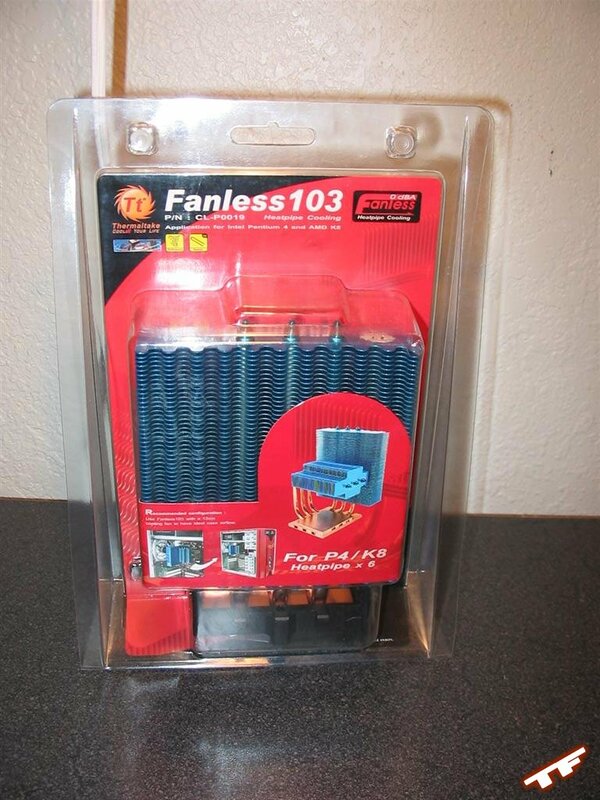 Yes, you heard correct, the Fanless 103 is a passive processor cooler. 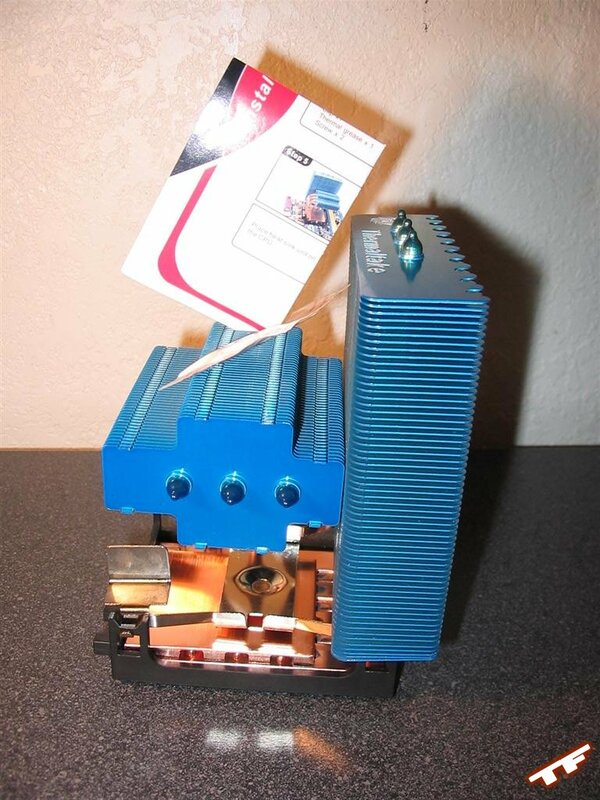 Similar to Thermaltake's Silent Tower, the Fanless 103 features heat pipe technology that quickly transfers heat from the Fanless 103's copper base to one of its two high-density, aluminum array of thin fins. Unfortunately, the Fanless 103 is a little misleading, while the unit itself does not need a fan, a case fan located near the cooler is not only recommended, but required. 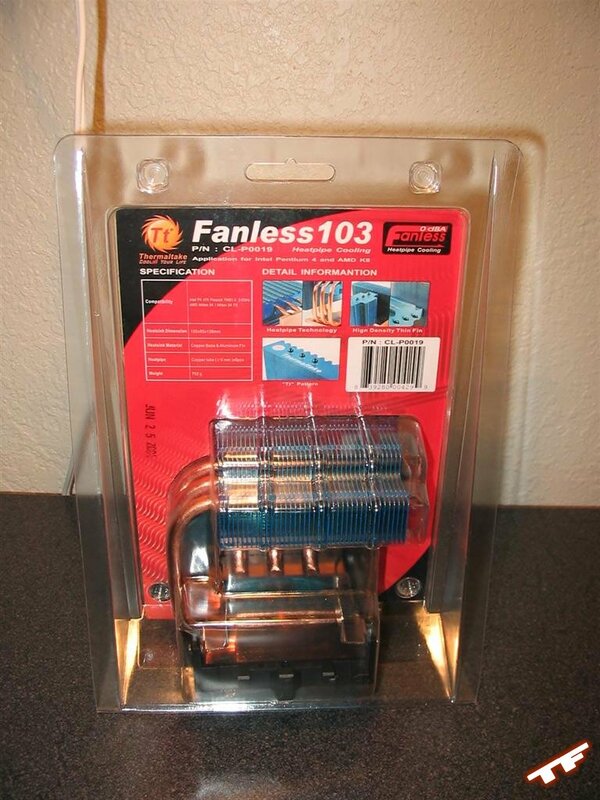 Coming packaged in a clear plastic casing, the Fanless 103's blue fins and copper heat-pipes are beautifully displayed. Thus making the Fanless 103 quite an attractive item to the window-shopper. Included with the Fanless 103 are a retention frame and clip (both come pre-attached, but for installation, you must separate them), a package of thermal grease, two screws and installation guide. Notice the Fanless 103 has its own retention frame, meaning your motherboard has to be able to allow you to remove only the current retention frame while keeping your motherboard's back-plate. Unfortunate for me, the Gigabyte K8N Pro uses a proprietary back-plate/retention frame. I have multiple motherboards at my disposal, but buyers should research whether or not their motherboard's retention frame is interchangeable. Installation of the Fanless 103 is painfully easy, following the included picture-guided manual, attach the retention bracket, apply thermal paste (throw away the included crap and buy some Arctic Silver), place the Fanless 103 on CPU, and using the clip, secure the unit in place. Aside from the time it took to switch motherboards, installation of the Fanless 103 should only take about a minute. 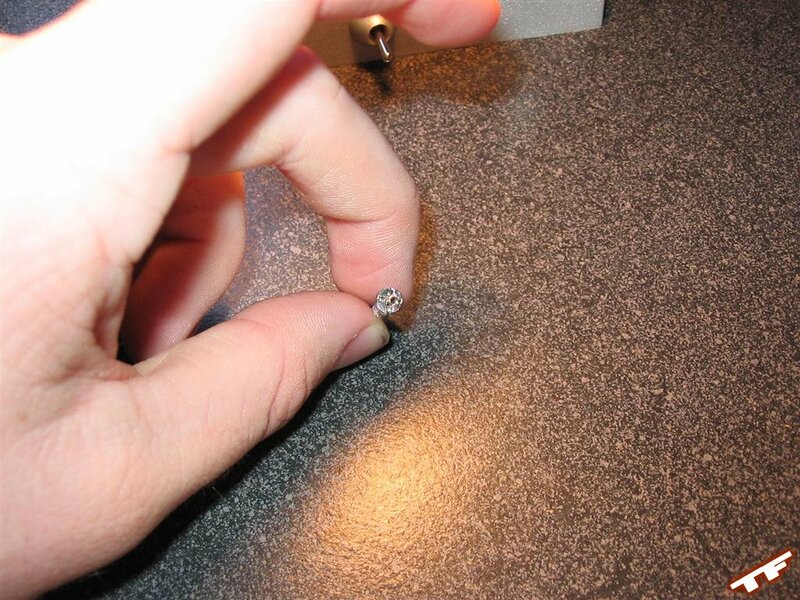 A problem I ran into was one of the included screws had a piece of metal lodged in the slot for the screwdriver, which meant I had to screw it in using pliers. This is probably a rare case, but is a slight problem that deserves mention. Speaking of problems, I noticed two miniscule flaws with the design of the Fanless 103. The first is that the way the Fanless 103 sits in the K8 motherboards, the larger array of fins are parallel to most PSU intake fans. 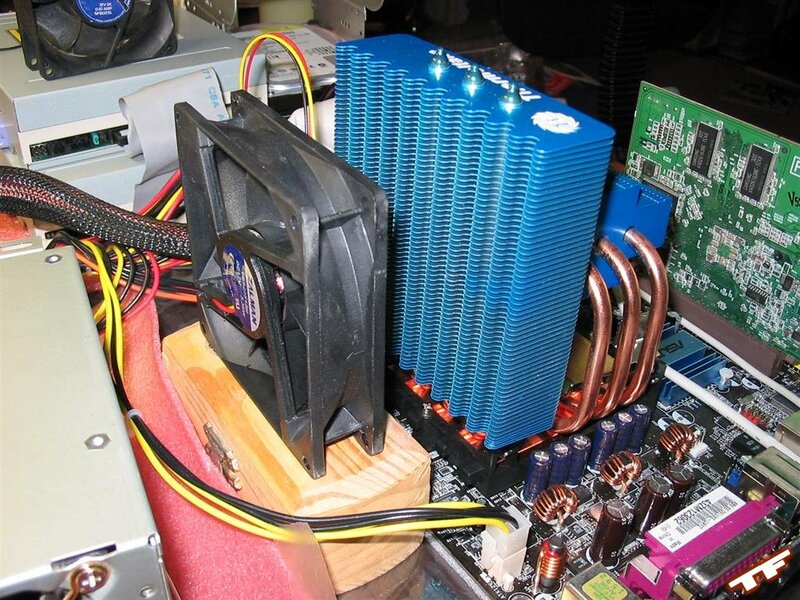 I would assume the desired effect is for the array to sit next to the case exhaust, as it probably isn't wise for the PSU to be sucking hot air from the processors heat-sink. Second is that the Fanless 103 hangs well over the CPU socket almost blocking the first DIMM slot on my ASUS K8V SE Deluxe. It also appears that the Fanless 103 would block the first DIMM slots in my Gigabyte K8N Pro and Leadtek Winfast K8N. All installed and well, let's see how well the Fanless 103 performs. 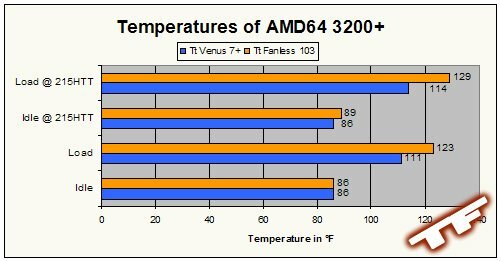 With an ambient room temperature of 79�F and a Zalman 92mm fan running at 1600RPM right next to the Fanless 103, we'll see how well it fares against one of its brothers, the Thermaltake Venus 7+. For the normal user looking to eliminate some noise from their system, the Thermaltake Fanless 103 Heat-Sink looks to be a considerable option. While it runs a little hotter compared to an active cooling solution, a temperature of 123�F (50.6�C) is still acceptable. 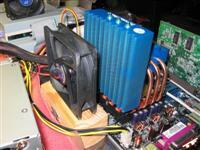 Not to mention the Fanless 103 stands strong against the Venus 7+ in both Idle situations. Only during load while over-clocked does the Fanless 103 reach a temperature of 129�F (53.9�C) which is a little too hot for me. I'd like to know if Thermaltake will release a new revision of the cooler giving my full recommendation to the Fanless 103. I cheated and ran the test system open-box so I was able to position a fan next to the Fanless 103; had I installed the Fanless 103 into a case, the temps might have been significantly higher. With processors getting more advanced and generating more heat, it is remarkable that a company could produce a capable passive cooling solution. Thermaltake delivers as their Fanless 103 holds its own at default chip speeds, but seems to lose a little bit of its edge while over-clocked. At a price of $50, the Fanless 103 is in a class of its own, but within the year, I'd expect Thermaltake to come out with a better revision of the Fanless 103. If you're looking for an immediately available, quiet solution for processor cooling, be sure to give the Fanless 103 a good look.